"Jump Up, Super Star!" (referred to as "NDC Festival" in-game) is the theme song of Super Mario Odyssey. 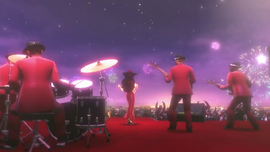 It is sung by Pauline during the mission "A Traditional Festival!". The song was also used in gameplay footage of Super Mario Odyssey during E3 2017, and is heard in the 100th episode of The Cat Mario Show. The song uses an upbeat, big-band jazz style, and is most notable for being the first song from the Super Mario series to feature lyrics, something almost never heard in songs from Mario games. 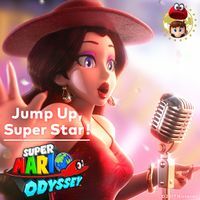 The song has Pauline detailing an adventure across the worlds of Super Mario Odyssey, referring to herself as Mario's "1UP girl." The lyrics are also printed on the inside of the game case for all regions. A Japanese version of the song has its own lyrics, unique to the international version. It can be played from a boombox in the Metro Kingdom and Mushroom Kingdom. This song was performed by the Super Mario Players and was sung by Kate Higgins (credited as Kate Davis) in English and songwriter Aimi Mukohara in Japanese. It was composed by Naoto Kubo, the original lyrics were written by Nobuyoshi Suzuki and the English lyrics were written by Rob Tunstall. The full version was released worldwide on October 20, 2017, on the iTunes Store, while the short version was downloadable for free until January 31, 2018. The "NDC Festival" version of the song also appears in Super Smash Bros. Ultimate, and can be played in any Super Mario-series stage. 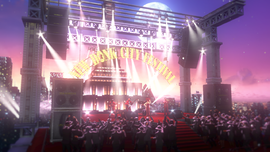 For the New Donk City Hall stage, two separate tracks exist in My Music: "Jump Up, Super Star!" and "Jump Up, Super Star! (Full Band Performance)." If the former is selected, only the drums are heard as only the drummer appears in the plaza, while Pauline and the rest of the Super Mario Players randomly appear throughout the match. Passing by them recruits them to perform their part in the song and appear in the plaza. If the latter is selected, the song plays as is, and the performers are absent from the stage. The song also plays in Mario's character trailer. "Jump Up, Super Star!" plays in the trailer announcing Pauline and other characters appearing as DLC for Mario Tennis Aces in 2019 during Pauline's segment. Nobuyoshi Suzuki, the sound designer of Super Mario Odyssey, wrote the first draft of the lyrics in Japanese. According to Yoshiaki Koizumi, they had a discussion on whether using words such as "1UP" would be good. They sent all of the documents they had to the localization members to create the final lyrics, due to English being a more global language, as Koizumi stated. This resulted in a back-and-forth between localization members and the Japanese developers as they struggled to keep the Mario references as subtle as possible. He also indicated in an AMA on reddit that the song had been created as a direct result of their developing the character of Pauline. The English version was the first to be recorded with voice actress Kate Higgins providing the vocals. According to herself, Cup of Tea Productions, Inc. was in charge of the voice acting. When asked if she was interested in doing the voice, she agreed and auditioned for the role by sending samples of her voice to Nintendo of Japan, and was ultimately selected for the role. Weeks before the recording session, Nintendo of Japan sent her a demo sung by an unknown Japanese singer and a lead sheet, with the music already recorded. Several people from Japan and America were present in the final recording. For the Japanese version, the Nintendo Sound Team had already some candidates, but after listening to her YouTube videos, songwriter Aimi Mukohara was chosen to do the vocals. All the Nintendo Sound Team was present at the moment of recording. This was the first time Aimi was involved with the music of any video game. Sou let's do the odessei! "Baibai" shite "mata ne to"
Sou, let's do the odessei! So, let's do the Odyssey! It'll be the beginning of your journey. You can get your 1UP! Will all suddenly go away. 1 - 「女神がキスをした」 (Megami ga kisu o shita) is a common way in Japan to say that the universe is on one's side, meaning things will go in the right direction. 2 - While the literal translation is "touch," the verb is referring to the act of grabbing coins as the coin sound effect implies, so another possible translation could be "grab." Jump Up, Super Star! - The theme song of Super Mario Odyssey, as heard in the E3 2017 Spotlight. The theme of 25m from Donkey Kong can be heard during the part where Pauline repeats the lyrics "Odyssey, ya see". In addition, the sound effect played when Mario jumps over a barrel in the game can be heard at the end of the aforementioned riff. Also, when Pauline sings "Odyssey, ya see" in the objective "A Traditional Festival!" in the game, she mimics her main sprite animations from her first game, Donkey Kong. "Jump Up, Super Star!" makes an appearance as one of the songs in the Nintendo Switch installment of Bandai Namco's Taiko no Tatsujin series, Taiko no Tatsujin: Drum 'n' Fun!, as well as in the Taiko no Tatsujin arcade game. ↑ Official Japanese page of Jump Up, Super Star!. Retrieved October 11, 2017. This page was last edited on April 18, 2019, at 19:14.